A heart shaped face is considered one of the most ideal face shapes you can have! If you have been told that you have a “heart shaped face” it is probably because you have a relatively wide forehead compared to a narrower chin, and, you more likely than not also have a cute widows peak and killer cheekbones! The best hairstyles for your heart shaped face will draw attention to your awesome cheekbones and tapered chin, but will frame your forehead in a way that makes it appear softer and less drastically different from the rest of your face. Take a look below at our top 25 picks for hairstyles for heart shaped faces! Reese has a gorgeous heart shaped face and knows that bangs suit her face shape perfectly! The choppy forehead bangs disguise how wide her forehead is and draw flirty attention to her eyes. Choppy bangs are a great alternative for girls who want bangs, but do not want blunt bangs that go straight across the forehead. Lucy’s wavy bob is super flattering on her heart-faced shape because it creates the illusion of a smaller forehead and draws attention to her beautifully sculpted jaw line. 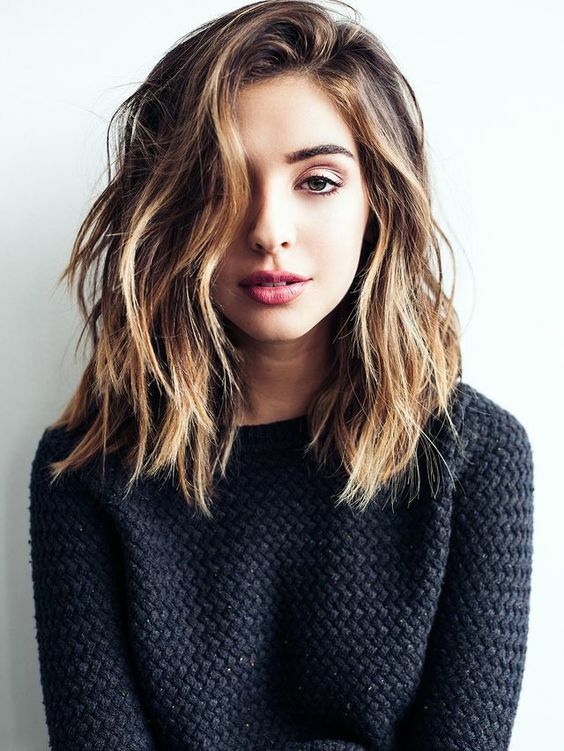 This shoulder length hairstyle with side bangs is a perfectly gorgeous cut to flatter heart shaped faces. The side-bangs are flirty and minimize Ashley’s wide forehead while also drawing attention to her cheekbones. How gorgeous does Camilla look with this elegant updo? This low chignon with a side part is the perfect updo for girls with heart shaped faces because the side part creates the illusion of a smaller forehead and also draws the eyes downward toward her lovely defined chin! Although bangs are always a flattering choice for heart shaped faces, Sarah proves that heart shaped girls can totally pull off a flattering bangs-free forehead style as well! This updo works to balance Sarah’s facial proportions because her hair narrows into a bun, which mirrors the way her face narrows into her pointy chin. Extra short hairstyles can be tricky to pull off if you want to maintain a feminine look, but heart shaped faces are perfectly suited for pixie cuts. Especially with bangs to soften the forehead, pixie cuts flatter heart shaped faces because all the attention is drawn to your awesome cheekbones and pretty jaw line. This is a flattering updo for girls with any face shape, but it looks particularly amazing on girls with heart shaped faces because it highlights the narrowness of the chin and makes cheekbones stand out! This asymmetrical bob flatters Rachel’s heart shaped face because it draws attention to her narrow chin and minimizes the appearance of her wide forehead. If you do not quite want side bangs, a side part is a great solution if you are trying to make your forehead appear less wide. This glamorous Lob looks incredible on Rosie! The feminine cut and side bangs look stylish and emphasize the best parts about having a heart shaped face: awesome cheekbones and a narrow chin! This elegant updo is understated but extremely gorgeous! The long split bangs are flirty and they work to soften her forehead while also making her awesome bone structure stand out! Shoulder length hair looks amazing on girls with heart shaped faces! Kerry’s eye-skimming bangs are fun and flirty, but they also are super flattering because they draw attention to her beautiful peepers! Lobs (long bobs) are so trendy right now because they are the perfect length to frame your face, but they avoid looking dowdy in the way that some bobs can. A middle part like Gabrielle’s is a great choice if you have a heart shaped face because your hairline creates a perfect straight line down to your gorgeous and fortunate chin shape! This is a super fun and chic look for girls who have a heart shaped face! Kirsten’s softly waved hair frames her gorgeous cheekbones and her short side bangs draw attention away from her forehead and toward her sparkling eyes! This sleek layered bob is an awesome choice if you have a heart shaped face because it slims your face and also looks very stylish! 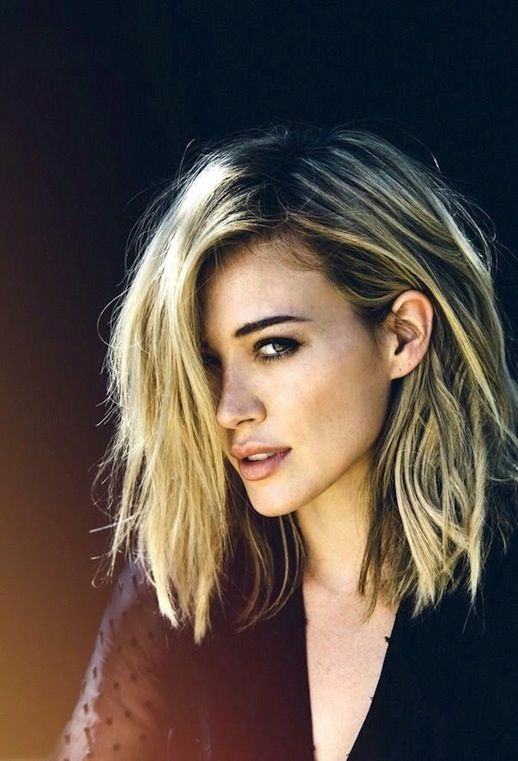 This messy hairstyle is very flattering on Hilary’s heart-shaped face since this natural looking messy style emphasizes her beautiful jawline and features. These blunt bangs disguise Keira’s large forehead and emphasize what cute cheekbones she has! Gigi is the epitome of a beach babe so it’s no surprise that she nails the beachy hair look! This long wavy style is perfect for her heart shaped face because her middle part cuts her forehead’s width in half and draws the eye to her lovely chin! If you have a heart-shaped face and want a hairstyle that looks effortlessly chic no matter what the occasion, Eva should be your inspiration! This is a classic and gorgeous style that will flatter most face shapes, but especially those lucky ladies with heart-shaped faces! Lobs are generally flattering for most face shapes, but they look especially awesome if you have a heart-shaped face! Demi looks amazing with this haircut because the angle of her hair draws attention to her eyes and bone structure! Emma’s haircut is neat, stylish, and also flatters her heart shaped face because it highlights her cheekbones while disguising her larger forehead. This easy updo looks glamorous because of Jessica’s flattering side bangs. Her bangs make her stunning eyes the focal point, and also emphasize how awesome her bone structure is! This is an awesome ponytail style for girls with heart shaped faces because it disguises a wide forehead while putting all the focus on the cheekbones and beautiful jaw line. If you’re more into simple and straight hairstyles, the low sleek ponytail looks great on girls with heart shaped faces.This style is perfect on the model’s face and emphasizes her beautiful features. Drew’s minimalist updo flatters her face because the middle part draws the eyes down to her fabulous jaw line. The wispy strands around her face also help to create a gorgeously casual bohemian look! This elegant side chignon looks gorgeous on heart shaped faces. This look is simple, but flattering, and looks awesome if you add a sparkly hair band like Charlize! As you can see from this list, heart-shaped faces look awesome with a variety of hairstyles! We encourage you to play around with your hair part because trying out a new angle can make a surprisingly huge difference depending on your haircut. Thanks for reading and we hope this list helps your find the perfect hairstyle for your heart shaped face! 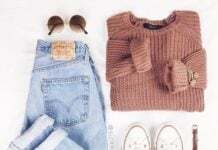 Michelle is freelance writer and graphic designer based in California. In addition to her creative pursuits, Michelle enjoys following people’s pets on Instagram, accruing rewards points at Sephora, and dreaming of world travel.